Civita di Bagnoregio is one of Italy’s most famous villages thanks to the beautiful panorama from the hamlet which sits on a tufa hilltop overlooking the valley of the Calanchi. The area of Civita was inhabited in Etruscan and Roman times and their hydraulic engineers were able to contain and deviate drainage waters to safeguard the hill. After the fall of the Empire, these maintenance works were abandoned and the hill was exposed to frequent landslides and collapse. The medieval hamlet’s name comes from the ancient thermal baths (bagni del re, balneum regis) nearby . It became important enough to be elevated to a diocese around 600 AD. In 774 the donation of Charlemagne made it part of the Patrimony of St. Peter. In 1140 during a period of general prosperity Bagnoregio became an autonomous town. During this period St. Bonaventure, general of the Franciscan order, cardinal and professor of Theology at Paris University was born. In the following centuries Bagnoregio was under the government of various Cardinals, among whom Reginald Pole, and became part of the Apostolic Delegation of Viterbo. Over the centuries the problems of landslides continued. Part of the monuments, the walls and doors of the city crumbled away. 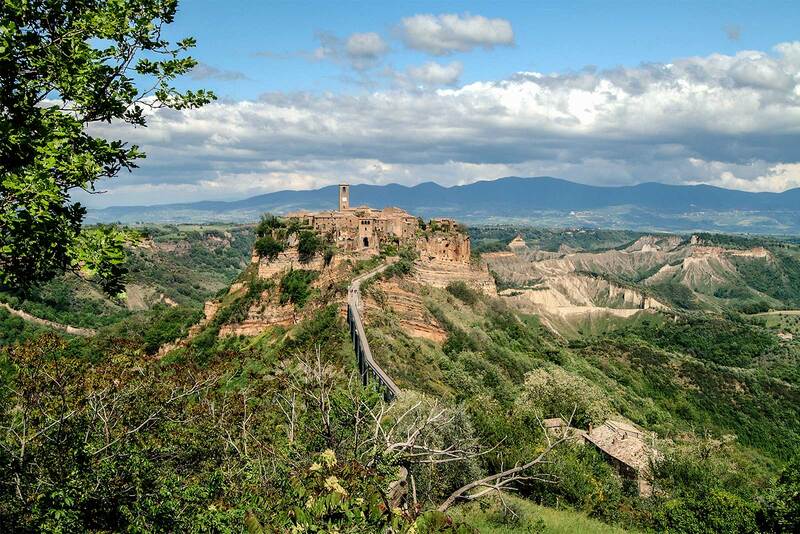 At the present time, Civita is mostly abandoned while it remains attached to Bagnoregio by a pedestrian bridge. Contact us using the form here to purchase a copy of the new historic, artistic and archeological guidebook for Civita di Bagnoregio!